Provides basic consumer health information about the diagnosis, treatment, and prevention of sleep disorders in children and adults, along with facts about diseases that affect sleep and the health consequences of sleep deprivation. Section 1.1-Why Do We Sleep? Section 1.3—Is Sleeping a Dynamic Activity? Section 1.4—How Much Sleep Do You Need? Section 13.1—Why Drowsy Driving Is a Problem? 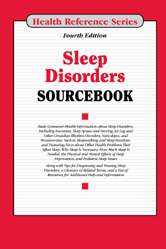 Chapter 17—What Are Sleep Disorders? Section 41.1—What Are the Common Symptoms of Sleep Disorder? Chapter 45—How Is Insomnia Treated? Chapter 55—What Are Clinical Trials?